And I mean that in the nicest way possible. The Luca Guadagnino remake/homage/love letter Suspiria will certainly draw rave reviews from the Dario Argento fanatics out there, but how does it hold up for the layperson? Well, I'm happy to say that while the film truly earns the Argento seal of trippiness, the film should play quite nicely for most horror aficionados out there. Of course, Suspiria is not for everyone and with its two and a half hour run time, it will certainly test the patience of any horror buff, but we promise that the payoff is most definitely worth it. If you are a fan of Dario Argento, you will appreciate all of the subtle nods to the horror master. If you are too young to appreciate Dario Argento, first, shame on you, second, there is still plenty to like about Suspiria and perhaps your fondness for the horror maestro will increase after seeing Suspiria. 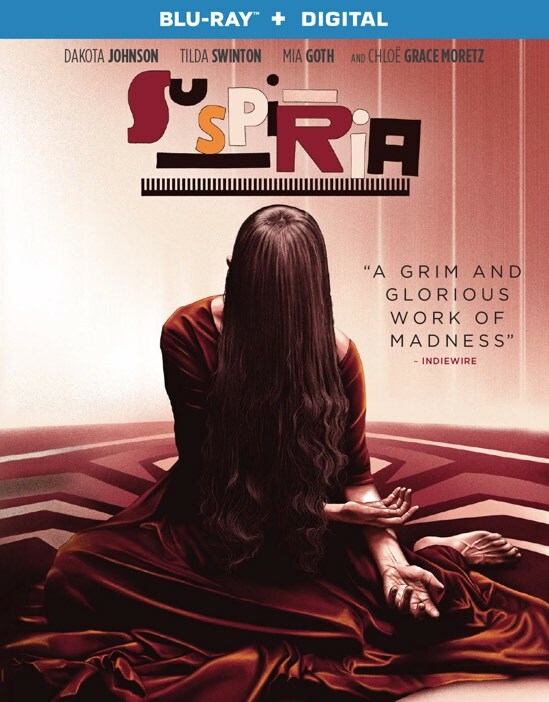 Much like the original Suspiria, this film follows Susie, a young American ballet dancer, who enrolls in a prestigious dance academy overseas. This time, the events take place in 1970s Berlin, 1977 to be exact during the Lufthansa Flight 181 hijacking, and it becomes quite clear that there is much more going on at the dance academy than meets the eye. Suspiria is one of those films that you could literally talk about for hours. There is just so much to digest and so many themes worthy of discussion that it's hard to really distill it all down for a simple film review like this one. Besides, as they tell us in True Romance, it's always best to talk about movies over pie. This movie will certainly inspire conversation after it ends and that's the hallmark of all great films. Unlike most of the horror films out today, Suspiria harkens back to a simpler time of horror when the scares were mostly in your head and not right in your face. Think of movies like The Exorcist in which the amount of blood and gore was balanced by the sheer terror that the film unleashed in your mind. Don't get me wrong, there is plenty of blood and gore in Suspiria, but it serves almost like a visual marker for the horror that lingers inside your head. Much like the Dario Argento "Three Mothers" trilogy of which Suspiria is the first movie, the new version wades heavily into the mother mythology. With a cast that is almost entirely female, the movie evokes a certain feminine power that is more carnal and vindictive than anything that the #MeToo movement could conceive. No, the nurturing motif of the mother is almost completely abolished entirely to make way for the reluctant ideology of a symbiotic sisterly bond that is akin to what you would find in many historical witch covens. Caught in the middle of this power play between the older and the new generation are three young dancers played by Dakota Johnson, Mia Goth and an almost unrecognizeable Chloe Grace Moretz and a bevy of ancient powers led by the always phenomenal Tilda Swinton who plays Madame Blanc (among others). I don't want to give too much away, but let's just say that the last act of the movie is simply breathtaking in its horrific beauty and stands as one of the most iconic horror visuals that I have ever seen. Speaking of Tilda Swinton, she actually plays three different roles in the film and I challenge you to figure out the other two without cheating. To say that I was completely surprised when I found out would be a great understatement. She is clearly one of our most talented treasures and while her films tend to meander from the mainstream, there's absolutely nothing wrong with that. As I mentioned, this film is not for everyone and you probably won't be shocked to find out that there is a stark divide among critics. There doesn't appear to be any middle ground either as they either love it or absolutely despise it. In fact, Dario Argento recently weighed in on this remake and he was rather unimpressed. That surprises me because as I watched Suspiria I was taken aback at how director Luca Guadagnino painstakingly crafted a film that not only celebrated the work of the earlier master, but could have just as easily been mistaken as an update from Argento himself. There are certain scenes that are shot in a way that you would swear were lifted from Argento's early works. This conscious decision to shoot the movie this way only added to the film's creepiness. It gives the audience a real "fly on the wall" feeling as the craziness starts to ooze out of the walls all around you. Again, your mileage may vary, but I found Suspiria to be a worthy homage to a bizarre filmmaker that was way ahead of his time in spooking his audience. If you are even remotely a Dario Argento fan, then I can't recommend this film enough. Even if you've never heard of the guy, I'm betting that if you've made it this far, you will find plenty to like in Suspiria. Suspiria is now available only on Blu-ray, no DVD for this one.